How is the Radiant Edge System Controlled? “A Ventilated Roof Will Prevent Ice Dams.” False!! We all agree ventilation is beneficial for a home, however, experts say it is often highly over-rated as a solution for ice dams. Many factors when designing a properly ventilated roof are not given adequate consideration or are missed altogether. Roof layout (dormers, valleys, etc. ), slope, air leaks, true insulation values and airway passage sizing must all be carefully calculated and constructed, and still may not eliminate ice dam formations. This roof to the right was constructed with R-40 insulation and continuous eave and ridge ventilation. 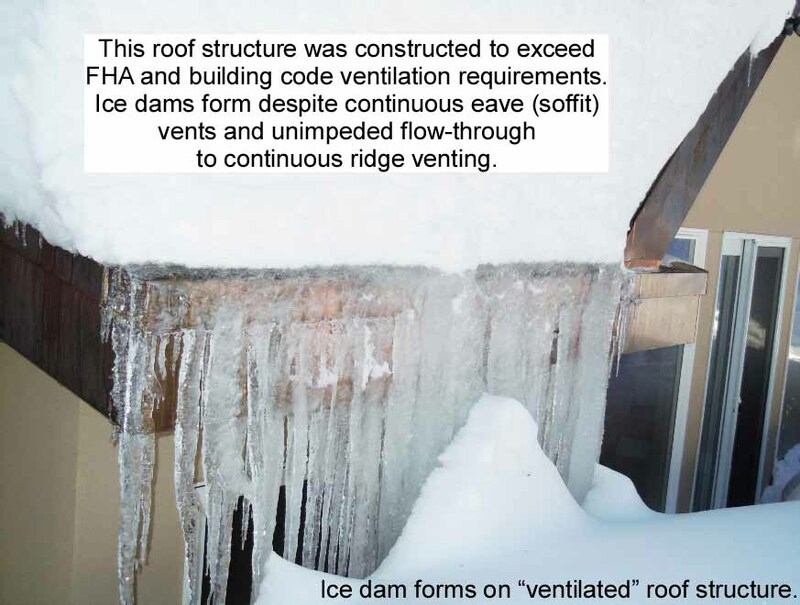 Here’s a thought about which you don’t hear among ventilation proponents (but real-world observations show): when the primary element of flow-through ventilation–continuous ridge venting–is covered with even a few inches of snow, flow-through ventilation is impeded and ice dams begin forming. Even a well-designed ventilation system stops venting. Previous Myth: How Much Heat Up The Roof? Protected under U.S. Patent #8,946,601 and other patents pending. “Radiant Edge”, “Radiant Edge PRO”, “Radiant Edge LT”, “Radiant Edge LowSlope” “HotSlot” and “Thermodynamics analyzed. Applied” are trademarks of Summit Ice Melt System, Inc. All rights reserved.